I talked myself into reading the follow up to My First Murder – these are the first two of the 12 books in the Maria Kallio series by Finnish author Leena Lehtolainen. They aren’t great but this one is better than the last one. I’m interested in the Finnish setting and Maria Kallio caught my attention after I kind of understood her – a little bit anyway. 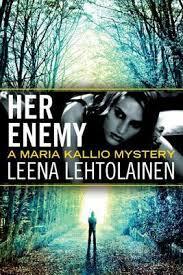 The crime story is adequate to interesting and I can see why Lehtolainen is popular in Finland. Maria Kallio started her career as a temporary chief detective in My First Murder. She is very feminine but also very feminist and doesn’t quite fit the bill of the US professional tough-guy cop. But between that first book and this second one a couple years have passed and she’s now a criminal attorney (her original primary goal) and seems to have grown up a tad. This time a relative of Maria’s boyfriend has been killed and the prime suspect, another relative, asks her to be his defense lawyer. The investigations take Maria to some pretty seedy places. As in the prior novel, there are many related characters some with similar names and only Maria is very well defined. There is a handy-dandy character list at the beginning of the book.